POLITICAL PRESENCES OF THE BULGARIAN CITIZEN: WHERE FROM, WHERE TO? title: Citizens, Parties, Elections: Bulgaria 1879-2009. Twenty-five years of academic political science in Bulgaria is probably not long enough to make serious generalizations. But it is long enough to identify trends, to establish parallels, to single out achievements. Antony Todorov’s monograph Citizens, Parties, Elections: Bulgaria 1879-2009 is remarkable, even just for its scope. I cannot think of a larger-scale attempt in Bulgarian political science to cover such a vast research field. One of the most important characteristics of European modernity – the participation of citizens in politics – is examined throughout the history of the modern Bulgarian state. Only clearly defined goals, tasks and methods, only precisely formulated limits can produce a systematic scientific result from such boundless subject-matter. And not only that. But also the scientific maturity and research talent of the author. I say this at the risk of entering the trite field of clichéd compliments that seem to have become an obligatory part of the ritual in presenting a work to the public. But those who read the book will see that my admiration is well-founded. The book is remarkable not just for the vast amount of empirical information collected and arranged in (literally) hundreds of tables, maps and diagrams which increase its value as a reference work, but above all for the boldness and well-foundedness of the analysis and conclusions. And for the total absence of conformism. Antony Todorov situates his studies in the achievements of Bulgarian social sciences and in global political science. He acknowledges the importance to him of the works of many Bulgarian authors, among whom I will mention especially Georgi Karasimeonov, Rumen Daskalov, Plamen Georgiev, and Todor Galunov. At the same time, he has made a precise and well-reasoned selection of the foreign theories and models that are discussed in his book: Milbrath and Goel, Claus Offe, Sidney Verba, Torcal and Montero, as well as colleagues of the author from France and Belgium with whom he has worked for years on part of the problems examined in the book. The institutional-cultural complex is a dynamic category that allows one to cover both situationally and strategically different stages of the Bulgarian socio-political reality. At the same time, this category is instrumentalized, it is guided by a clear structural effort to reveal political participation consecutively, through the degrees of its intensity or, in other words, through its phases: from the construction of a general notion of the political to the formation of political choice and political mobilization for direct political engagement. These four phases are at the basis of the structuring of the monograph in chapters. I will limit myself to a general overview of the chapters. Chapter One argues that in the process of mastering politics, political culture is a basic category. Bulgarian political life was burdened with inherited characteristics of a still patriarchal society with its way of thinking and socialization stereotypes. The role of modernization is also pointed out, mainly in those aspects of modernization that are related to mass education and urbanization. In principle, they intensified the politicization of society. The complex structure of self-identifications and the influence on them of foreign political references along the Europe-Russia, Europe-America and Bulgaria-Turkey axes acquired significant importance in those processes. Key conclusion: a distinctive characteristic of Bulgarian political culture is the absorption of foreign influences, something which is specific to peripheral societies. Chapter Two studies the motivations for making a political choice, which are examined in their dependence on structural factors, that is to say, factors resulting from a long historical and social process. Two types of factors are identified. Firstly, historico-structural factors also known as cleavages – large, long-lasting social conflicts of a structural character, caused by modernization. It is argued that the most important elements of modernization are the autonomous public power of the nation-state (from which follow the secular/church and centre/periphery conflicts) and modern industry (from where arise the urban/rural and workers/owners conflicts). Secondly, social-structural factors manifested in the variety of social statuses and the changes in the latter. The permanent process of transformations in the social-class structure of society is interpreted, with a focus on transformations in the context of two intensive waves (in the 1950s and 1960s, and in the 1990s). Special attention is paid to geographical status, which explains the role and staying power of local clientelistic networks in politics. Key conclusion: Bulgarian society acquired the characteristics of a modern European society with the typical of the latter political divisions which, however, were largely determined by concrete and conjunctural historical events. Chapter Three deals with political mobilization as a dynamic aspect of political participation. It analyzes the changes in political preferences, understood as changes in the political status and attitude towards politics: from non-voting to voting and vice versa, from one party to another. The institutional framework of participation (embodied in the effective electoral legislation) and the impact of political parties (organizing, attracting, structuring the vote) are defined as the central factors. In this context, Bulgarian citizen participation is realized in an intensive inter-bloc movement marked by the establishment of three structural political blocs (apolitical, government voters, party voters). Key conclusion: the mobile voter is the main type of political behaviour in Bulgaria both before 1944 and after 1989. Chapter Four looks at political engagement, interpreted within the framework of an organizational and party life which presupposes personal investment of time, efforts, and often money on the part of citizens. Three main types of motivation for such participation (elitist, class-based, and nationwide) are presented through the prism of the internal functioning of organizations (missionary, democratic, leader-centric). The presence of parties and the motivation of citizens are found to have been invariably unstable both before and after the era of socialism in Bulgaria. Key conclusion: political engagement nevertheless contains elements of stability, it varies within a narrow range but remains in place without tendencies towards its marginalization. In a short review, I cannot mention all the valuable concrete observations on political life which flesh out the construction. I will only note that Antony Todorov makes a number of contributions to making sense of real political situations and proves, once again, the advantages of historical political science in understanding Bulgarian political history. Using Todorov’s instrumentarium, every reader could expand and develop many of his theses. The elaboration and application of the term and concept of ‘institutional-cultural complex’ is a major contribution of the author. Oriented primarily towards institutional analysis, electoral studies, theory of political parties and political theory, Bulgarian political science tends to avoid the problems of culture (of course, with important exceptions such as Todor Tanev) and leaves it, quite improvidently, to Cultural Studies experts. One reason for that may be the fear of sinking into the general essayistic-generalizing spirit of the so-called ‘ethnopsychology’. Todorov’s book fills a gap. Culture becomes a full-fledged subject of political science – not in itself but as related to political institutions and norms, something which is possible only in the course of interactions of citizens. Finally, I will formulate three conclusions and one criticism that follow from my reading of the monograph. What is actually revealed is the meaning of political ideologies in the broad sense of the term, as a space between the production of ideas in human history and the creation of political forces (not necessarily parties). Here ideology is clearly shown to be an approach towards the formation of real policies. 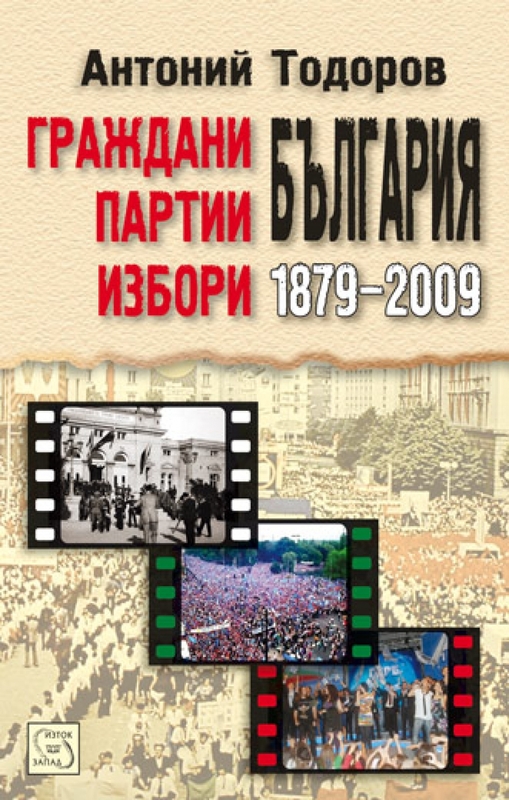 In this, Citizens, Parties, Elections is a bridge between Modern Political Thought (2001; in Bulgarian) and Political Life in Bulgaria (2005; in Bulgarian) by Antony Todorov. The ambitious study of three periods in modern Bulgarian history from the Liberation to the present day is possible only through the institutional-cultural complex approach. An analysis limited to institutions would be misleading. An analysis limited to culture would fail to account for the legal and political reality. Their combination proves that the Bulgarians have always been one state because they have been one society that has existed through the reproduction and change of models, orientations, and practices. The precise analysis of the specificity of the Bulgarian historical path is yet another scientifically justified rejection of the until recently dominant paradigm of transitology, of the invariant realization of democratic transitions wherever dictatorial regimes fall from power. The Bulgarian public is familiar with Thomas Carothers’s convincing arguments against the transition paradigm. Recent studies explicitly (Nadège Ragaru) or implicitly (Antony Todorov) question the dogmas of this already outdated trend of thought. This book may be criticized on various points, but they are more a matter of detail than of substance. Still, I believe that the role of foreign influence on the Bulgarian political process and on the formation of citizen participation is overestimated. It is overestimated as a real political factor (for example, the thesis that pre-war Bulgarian fascist and quasi-fascist organizations were the result of imitation of foreign models rather than, to a large extent, also of internal processes), but also as possibilities of political-science terminology (for example, the introduction of the term ‘militantism’, which sounds inadequate in the otherwise strong analysis of political engagement). Citizens, Parties, Elections is a seminal book that will help us make sense of politics in modern Bulgarian history. And it is one of the keys to the mysterious keyhole of Bulgarian (?) citizen (?) democracy (?). Antony Todorov – Citizens, Parties, Elections – Bulgaria 1879-2009.